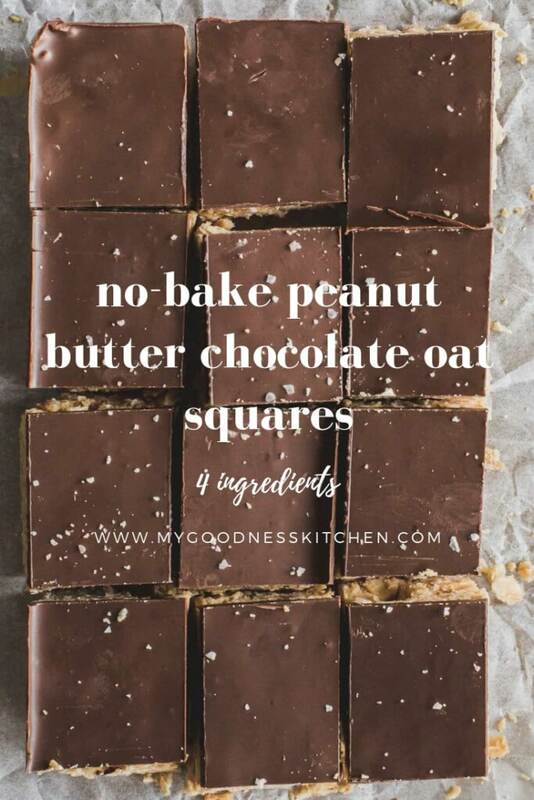 For the days you need something sweet and you need it fast, these No-Bake Peanut Butter Chocolate Oat Squares can be prepared in around 10-minutes and require only 4-ingredients. Breathe…the chocolate is on its way. “I could eat these squares for days, they’re perfect,” my omnivorous husband said. Pretty nifty praise for a treat that took a few minutes to whip up and contains no dairy or processed sugars. More amazing still this coming from a man who “doesn’t get” peanut butter. I don’t “get” people who don’t get peanut butter. What’s not to get? It’s like oxygen but with peanuts in it. But I already married him so what are you gonna do? If I were trendy I would call this the ultimate minimalist square. But I am not trendy, I am a forty-something author and food blogger living on top of a mountain. I sometimes wear socks with my vegan Birkenstocks. In public. However, the minimalist tag is very appropriate here. Four ingredients and no baking = pretty darn minimal. 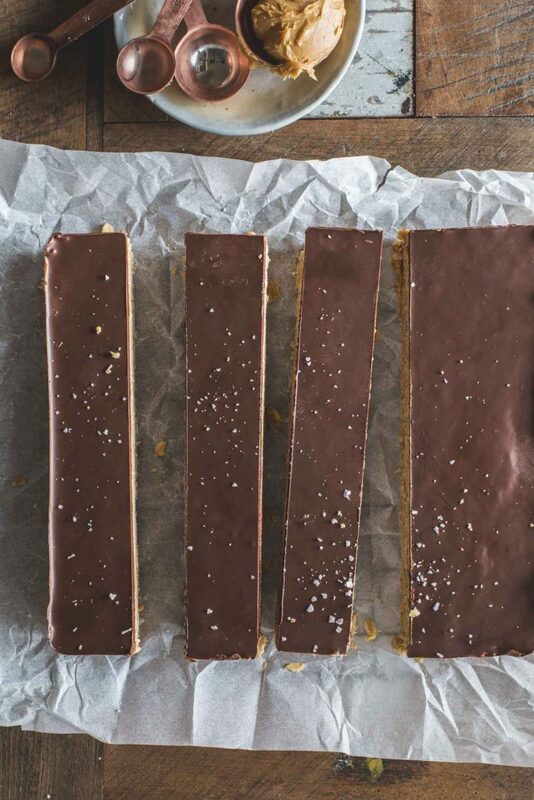 So what’s in these minimalist No-Bake Peanut Butter Chocolate Oat Squares? You could make your own chocolate but if like me, you are impatient, bought chocolate is fine. It’s more than fine. It’s downright awesome. Another neat thing about this recipe is that if you can’t do peanut butter, it works with almond butter too. 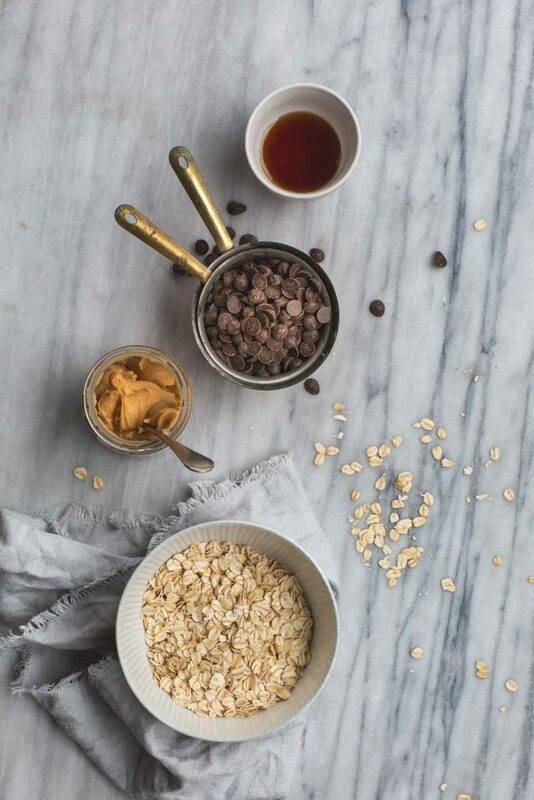 Swap out the peanut butter for almond butter and add a teaspoon of vanilla extract. 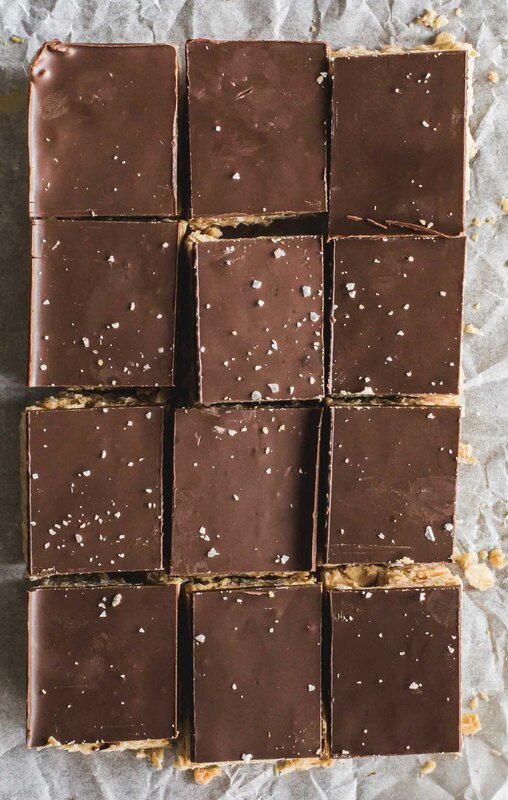 Presto, nut butter and chocolate squares. Whichever you use, these fantastically fuss-free squares are deliciously chewy, chocolatey and completely addictive. When life feels anything but minimal, these little guys are a simple reminder that less is usually so much more. Enjoy, x. 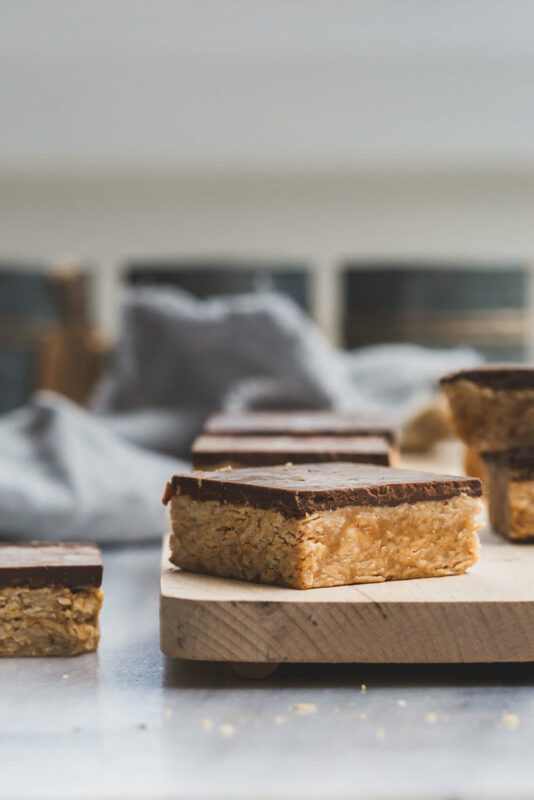 For the days you need a sweet fix and you need it fast, this No-Bake Peanut Butter Chocolate Oat Squares requires on 4-ingredients. It's sweet, sticky and ready when you need it. Line a square brownie tin with grease-proof paper. Add the peanut butter and maple syrup to a medium saucepan and stir together over medium heat until combined. Add the rolled oats and stir through so the oats are completely coated and combined. Remove from the heat and transfer the mixture to the lined brownie tin and press down to get it as level as you can. Set aside. In a microwave or over a double boiler, melt the vegan chocolate and peanut butter together, stirring occasionally to combine. Pour the melted chocolate over the oat mixture and use a spatula or the back of a spoon to level out. Pop the slice in to the fridge for at least 30 minutes or until set or in the freezer for around 15 minutes. Slice in to squares to serve. The flavor is good, but mine came out very chewy and fell apart quite easily. Very messy to eat. I used an organic “Old Fashioned Rolled Oats” (longer cooking time). I wonder if this recipe should call for the quick cooking oats? Also my chocolate topping didn’t “pour” out of the double boiler. These are good, but not what I was hoping for.